Nothing says summer quite like completely impractical white leather. 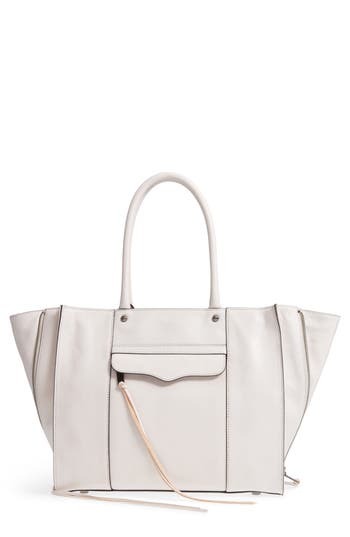 This modern classic Rebecca Minkoff MAB Tote comes in putty white and includes the updated side zip gussets of recent seasons. Like all RM bags, this tote comes with plenty of pockets and organizational spaces, including an external zip pocket, interior zip pocket, and smartphone pocket. Unlike most totes, it also has a top zip. Handy, right? This smart handbag will go with just about anything your summer wardrobe has to offer, including business professional office-wear. Just be sure to use a waterproof protectant spray before taking it out in the wild. I suggest Collonil, which has never let me down. → Buy the Rebecca Minkoff MAB Leather Tote, $176.98 (was $295.00), at nordstrom.com; free shipping.